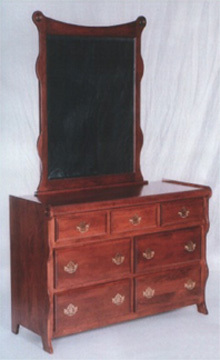 The 53” Amish made sleigh style dresser, shown here in solid cherry, is perfect for those of you who still want a dresser as part of their sleigh-style bedroom collection, but don’t have the space. With its seven drawers, there is plenty of storage room for just about everything, and still room on top for the things that matter. Shown with the optional rail mirror, but will also accept the center mirror, and it is available in solid oak for those of you looking for oak bedroom furniture. This will definitely be a piece of bedroom furniture that you can hand down through the generations.